Establishing a debtor's/defendant's financial worth and whereabouts is key when considering launching a legal action and when trying to enforce a judgment. Our reports will help you trace assets, locate secured and unsecured liabilities, determine the debtor’s whereabouts for service purposes and locate bank accounts and wages for garnishment. They will also identify fraudulent conveyances, assignment or preference. Asset Identification: Determining the defendant's assets can be valuable information when preparing for an Examination in Aid of Execution and for Discovery. Debtor Status: The Debtor Status Report is an excellent decision making tool for lawyers and lenders. We can give you the answers prior to; launching the action, entering into settlement negotiations, and satisfying the judgment. 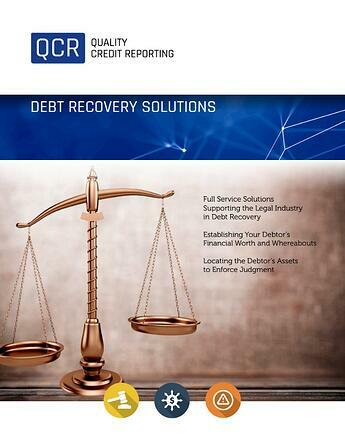 Debt Recovery: Determine the probability of debt recovery or satisfying your judgment using a Debt Recovery Report from Quality Credit Services. Our Reports can aid with the various methods of enforcement and the location of the debtor for service purposes.